Used to indicate the wind direction in the ultimate approach and take off area. It is also used to give a general indication on the wind speed. This product can indicate the wind direction in the ultimate approach and take off area and give a general indication on the wind speed. Every airport should be equipped with at least one vane. For the installation location, it must not be intervened by a nearby object or the airflow blown by the rotary wing and must be seen from the helicopter in the air. 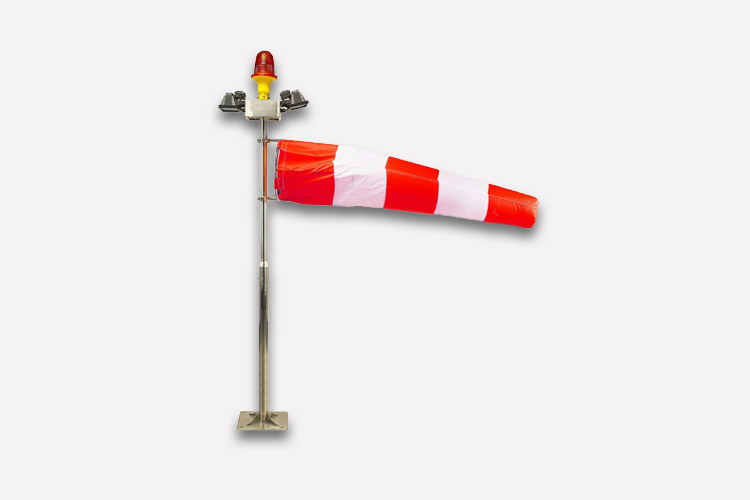 An illumination vane can be used as a sign in all kinds of airports to observe the wind power and wind direction in both daytime and night. The wind sleeve is installed in a 360°bearing rotation gear and there are two 100W metal tungsten halogen lamps on the top to provide illumination at night. There is also a red obstruction light on the top. The wind sleeve is made of corrosion-resistant and high-temperature-resistant nylon flashing material. The power supply of this product is 220V and 50Hz.